Q. What time is check in / check out ? A. Check-in time is 14:30 PM , and check-out time is 10：00 AM . Q. Is there late check out available ? A. Yes , late check out is available until 12:00 pm . 2 hours for an additional charge of 1000yen , subject to availability . Q. Do you have curfews ? A. Yes, we do for a security reason . We lock the front door at 2:00am . However , Our reception is open for 24 hours . Please call us before arrival , we unlock the door . Q. Do you have parking spaces ? A. Sorry we have no parking space . Please call the hotel designated parking lot (Ueno Parking Center ◆TEL 03-3833-8151◆) or there are parking lot around our hotel with charges . Q. What is the child policy ? Can I stay with a child ? A. Children under 6 will not be charged as long as they do not need beds, and kids over 6 will be charged at regular rate . Q. Can I ship our percel before check-in ? A. Yes, you can . We can keep your percel at the font desk until your arrival . Please send your percel to this mailing address . Please make sure to fill out guest name and arrival date besides Hotel’s address . We cannot accept any percel/luggage without the name of the guest and accommodation date . You cannot send cash , valuables , fragile article , items which needs temperature control in advance . Cash on delivery is not acceptable . Q. What is your cancellation policy for individual hotel reservations ? A. 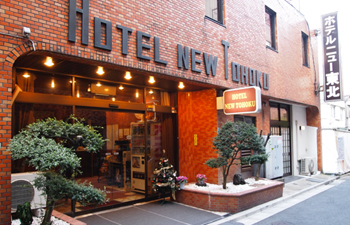 Hotel New Tohoku requires a minimum of 24 hours notice prior to your scheduled arrival date for a full refund . 100% of room cost will be charged if you cancel on the arrival date or you don’t stay without notice . Q. Do you accect a credit card ? A. Yes, we can . Q. Can I send my percel / luugage from the Hotel ? A. Yes, you can send it through Yamato transport system from front desk . Boxes and envelopes are available in free of charge depending on availability . Please feel free to ask us . Q. Can you keep my luggage after check-out ? A. Yes , we do . On the check-out date , we keep your luggage free of charge . Additionl charge will occur from next day of check-out date . If the guest has another reservation , additional charge will not occur . Q. Is there laundry room at the Hotel ? A. Yes , we have one washing machine and one dryer on the ground floor , next to the dining room . As the machine includes detargent , you don’t need to buy it . Cleaning service is also available , please feel free to ask at the front desk . Q. Is there elevator at the Hotel ? A. Sorry , we do not have elevator . Our staff will carry your luggeges if it is heavy . Q. Do you have some guide for sightseeing ? A. We can research the places you would like to visit . Please ask at front desk . There are also maps and brochures at the hotel lobby . Q. Can I borrow PC ? A. Sorry, we have no PC rental service . However , PC is available free of charge for guests at the hotel lobby . Q. Is there ice machine at the hotel ? A. We have no machine . If you need ice , feel free to call the front desk . We give you ice for free . Q. Is there vending machine at the hotel ? A. A vending machine for juice and alcohol drink is available at the hotel lobby on the ground level . Q. Is there large public bath and spa at the hotel ? A. Sorry , we do not have them . Q. Can you throw away my suitcases that I don't need anymore ? A. Yes , we can do it with additional charges . Leave it at the front desk . If you leave your suitcase / luggage after check-out without notice , additional cost will be charged . We will contact you later . We appreciate your understanding . Q. Can I use internet at guest room ? A. Yes , all guest rooms have high speed internet and free-wi-fi . For using high speed internet service , please set your IP address “0” . Free wi-fi is available any place at the hotel . ID and password are on the information board at a guest room . Q. What amenities do your guest rooms have ? A. shampoo , conditioner , body soup , bath towel , face towel , informal cotton kimono , slippers , tissues , tooth blush , razor , teacup , tea bag , cup for bathroom . Trouser Press , Iron with ironing board , humidifier , deodorizing spray , mobile rechargers ,digital scale are also available . Q. Is there a hair dryer at guest rooms ? A. Yes , all guest rooms has a hair dryer . Q. Does toilet equip with a bidet function at guest room ? A. Sorry , a bidet function toilet is only at the shared restroom at the hotel lobby . Q. Is there pot at guest room ? A. All guest rooms have tea server . Electric pot rental is also available at front desk . Q. Is there non-smoking rooms ? A. Yes , there are . However , availability is limited . If there is no availability , we clean and deodorize a room before check-in . Q. Can I invite my friend to the hotel room ? A. Our hotels do not allow a non-registered guest to stay a hotel room under the accomodation clause . Please meet a non-registered guest at the hotel lobby . Q. What is power voltage in japan ? A. The voltage in Japan is 100 Volt . We don’t have a voltage converter . Please have your converter with you or you can get it at electronics retail stores . Q. What time is breakfast and what is it ? A. Breakfast is available at dining area on the ground level . Set menu includes silver salmon ,small bowl ,pickled vegetable , seaweed , egg , rice and miso soup . After the meal , we serve coffee . Q. Is dinner available at the hotel ? A. Sorry , we don’t serve dinner at the hotel . There are a lot of restaurant and cafe within 5 minutes-walking distance . Do you have any preference , please feel free to ask the front . We will give you information . Q. What is the nearest train station to the hotel ? A. It takes 5 minutes walk from Hirokoji-guchi exit of JR Ueno Station . It takes 2 minutes walk from Exit 2 or 3 of Metro Ueno station . It takes 10 minutes walk from Keisei Ueno Station . Q. How can I get there from Ueno Station ? Right after the exit , there is a pedestrian bridge on the left . Go upstairs , and you will see the blue sign “Joyo Bank”go towards the sign and you’ll see the stairs to the ground level . Use the stairs and go down to the ground level . You should take the street between Joyo bank and Nissei Life Plaza . Go straight with your back to the Ueno station . Make left at the first light and turn right at the first small alley , and you will get to the hotel . Take exit 2 and walk towards left and make a left turn , you’ll see the stairs to the pedestrian bridge and escalator to the right . With your back to the escalator , go straight and you’ll see the white building on the right at the second intersection . The white building has the sigh of our hotel . Make right at the intersection and turn left at the second alley , and you’ll get to the hotel . Take exit 3 and go to the left and turn right at the street between Joyo bank and Nissei Life Plaza . Make left at the first light and turn right at the first small alley , and you can get to the hotel . After the ticket gate , go diagonally left and you’ll see the Underground walkway to Hibiya / Ginza line . Go straight for a while and you’ll see the sign of Tokyo Metro Ueno Station Exit 3 . Along with the sign , go to the exit . Q. Is there a courtesy pick up from Ueno Station ? A. Sorry, we don’t have a courtesy service . Q. Is there convenience store around the hotel ? A. Yes, there are a lot of stores within 1 min walk . Q. Is there ATM around the hotel ? A. Within 5 min walk , ATM of Mitsui Sumitomo bank and Joyo bank are available . And convenience stores like Seven Eleven also have ATM machine .